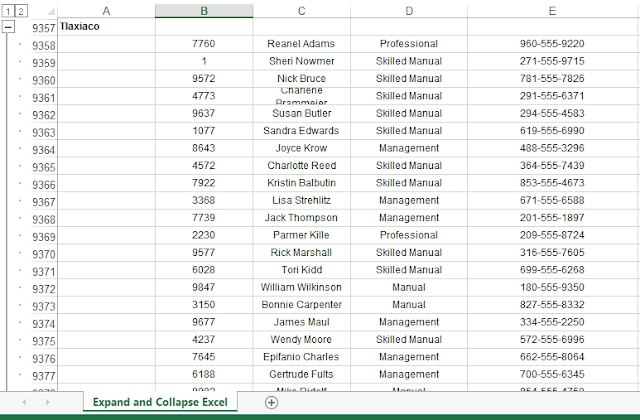 In this post you can learn how to get Expand and Collapse options when exporting a grouped by data excel report. Group Footer (Dummy Text field with 0 height). 3) Apply End property to the dummy field that you keep in Footer band. 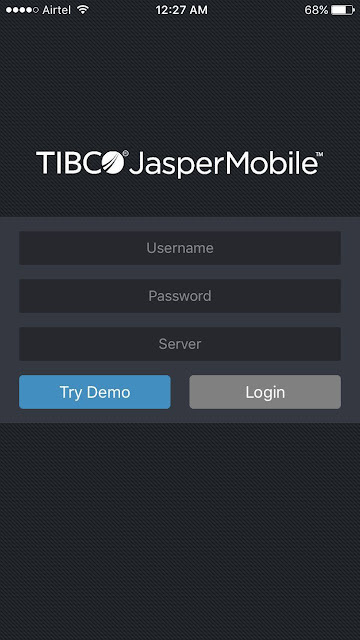 The TIBCO Maps component is available in the Professional edition of Jaspersoft Studio. In this example we show how to overlay polygons (e.g. "closed" paths or geographical areas) of US States on top of a map available via TIBCO GeoAnalytics. Alternatively you can use "open" paths to represent roads/routes or markers to represent specific points on the map, rather than areas. You can load data from any shapefile / geography, as per the article mentioned in the video: http://community.jaspersoft.com/wiki/how-generate-map-data-postgis-or-shapefiles-use-reports This is based on Jaspersoft Studio 6.1.1. It should work since release 6.1.0. For further details, including a sample file, see here: http://community.jaspersoft.com/wiki/how-use-tibco-maps-jaspersoft-studio-pro Thanks! 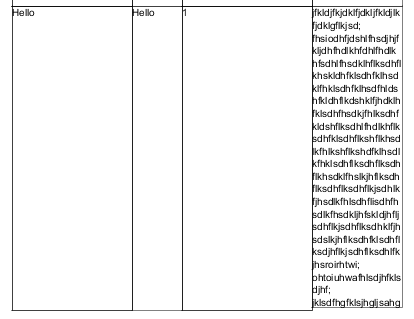 Usually we write grid reports by making use of column header and Detail band or table component in JRXML file. When write a grid report using column headers, we make use of Styles and conditional expression with REPORT_COUNT variable to get the alternative colors, similarly when we use Table component, we take check box utility in its style section to get the alternative colors functionally. 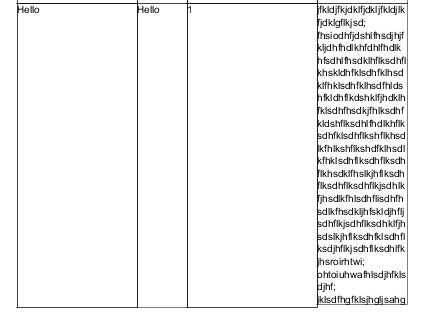 Today, I need to implement the row or column banding in cross tab component - cross tab also mean to display grid data but the data will be grouped by rows and columns. Neither we can't use REPORT_COUNT variable on cross tab fields nor any utility. Here are the steps to have row or column banding. 1) Write your cross tabular report. 2) Go to Style section from report outline or cross tab outline. 3) Create a Style -> Create two conditional Styles. One for row banding another for column banding. 4) Write below condition in 1st condition & on its Appearance section choose row banding color. 6) Now , go the cross tabs text elements and select them and apply Style1 in Appearance section for Style property. 7) Save your report and preview. 1) While choosing colors on condition do not uncheck "Transperant" property. 2) On cross tab text fields you must uncheck "Transparent" property. 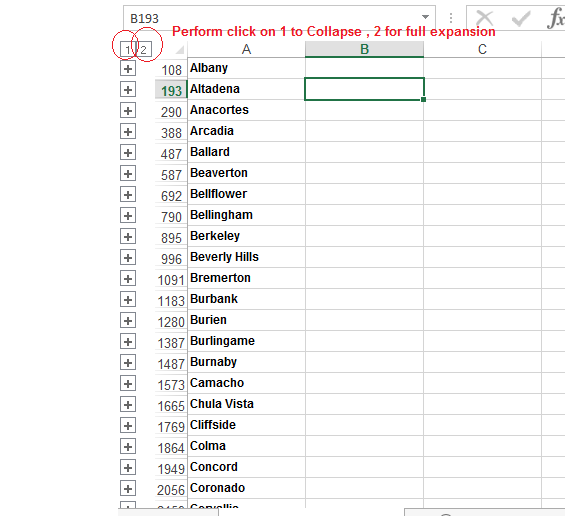 3) COLUMN_COUNT and ROW_COUNT are built in variables that you can see in grayed out color in Variables section. 4) ROW_COUNT is not available by default in variables section in 6.2 studio. Jasper server 6.2 Pro/EE releases have lots of improvements and new features. 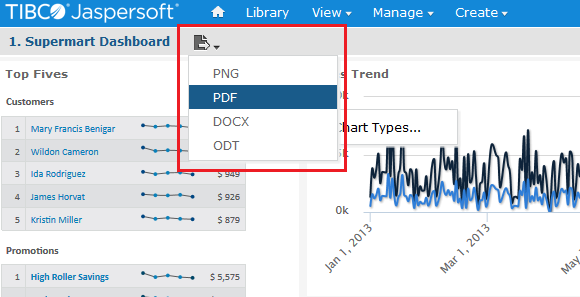 Today, I have gone through one of the features on server side in dashboard designer , that is Exporting dashboard to 4 variety of formats namely PDF, MS-Word , PNG image and OTD. 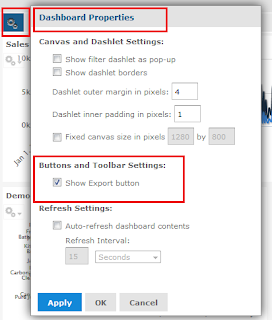 1) Dashboard designer properties section has a check box(In the designer mode of dashboard right click anywhere on the canvas) to enable dashboard export button when previewing. 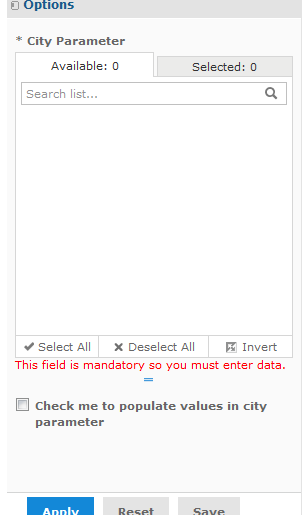 2) After checking it in dashboard designer properties if you try exporting the dashboard you may get error message. 3) To make sure the export button working correctly, you need to install the PhantomJS software in the machine/server where your jasperserver is hosted/installed. 4) Download and keep the PhantomJS in C drive or somewhere in the directory. 5) Extract the zip file and keep the phantomjs-2.1.1-windows folder in C drive. Inside into it, in the bin folder you can see phantomjs.exe file. 7) Restart the the Jasper server if it is already running and see the preview of dashboard and make use of export button. 2) Click the settings button and check the "Show export button" option. I hope it helps someone in configuring and in how to do . This tip is useful when you work with grid reports. The element will be printed when the band overflows to a new page or a new column. Tell the report engine to allow the text field to stretch downwards in order to display all its text when it doesn't fit in the defined text field height. This property will work irrespective of cell height that you provide. Both are the properties of a text field. From the above images, what you can understand is when Detail overflow is checked the text Static Text and Image filed data is repeating in next page. This tip is useful if you are loading thousands of values into an input control(single/multi). How much time the input control pane is taking to load when you run a large report in which one of the parameter is having thousands of values in it. Add a check box(boolean) parameter to your input controls pane window and pass this parameter to all your other parameters in the report - i.e., cascade all the other parameters with this boolean parameter. Once you cascade all the parameters, now when you run the report, the input controls pane for that report will load in matter of seconds hence the user will get experienced of the report is loading. Explaining only on server side : Cascade "paramCity" multi select parameter with boolean check box parameter. 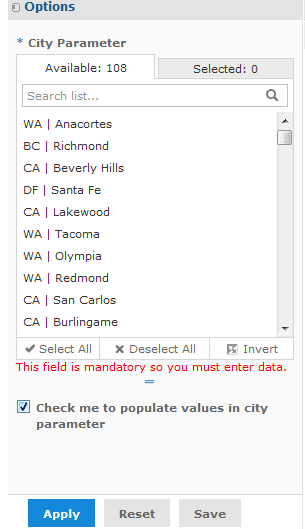 i.e., when you check the tick box then the values in "City" parameter should get loaded. NOTE : In jasper boolean parameters returns true or false. While cascading make sure true should be given in single quotes as shown in above SQL code. and the other parameter is "paramCheckMe" is of type "boolean" created. I hope this helps some one.! In this tutorial, you will see a quick walk through on Jasper Mobile Intelligence setup. 1) How to Install App in iPhone ? 2) How to connect to your hosted jasperserver from App ? 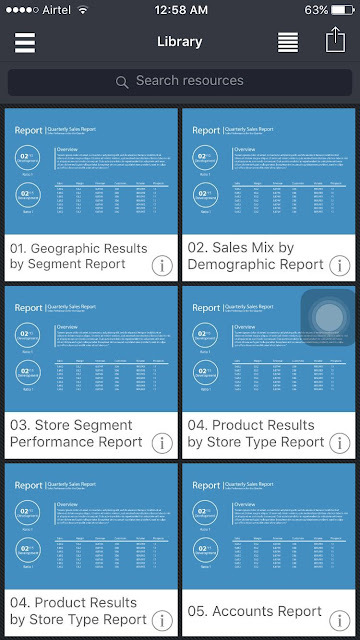 3) How to preview a Report in App? I have taken my own setup for this example, I have used my locally installed jasperserver to connect to mobile app over my home WI-FI network. 1) Windows 10 Operating System on which Jasperserver professional 6.2 installed and running. From Apple "App Store" search for "TIBCO JasperMobile"
Click on "Install" to get the app & after installation is done see the icon in tray. 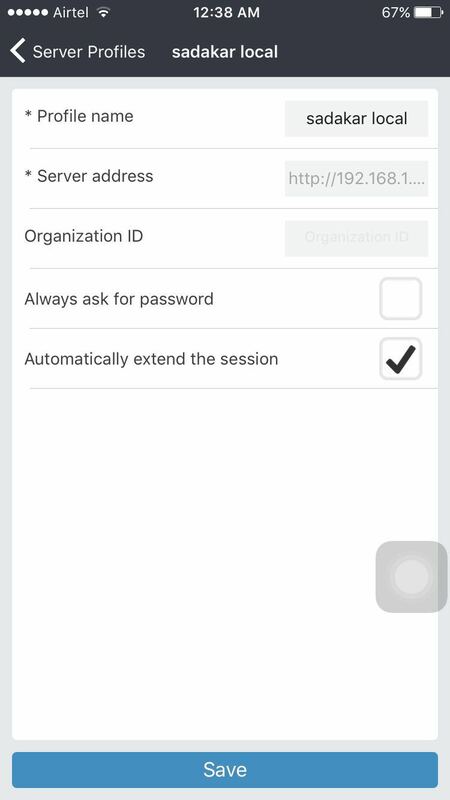 2) How to connect to your hosted jasperserver in App ? 1) You need to provide Username, Password and server connection details to connect to hosted jasperserver. 2) There is Server Profiles Page in App to add server(s) to connect. For that you need to click on "Server" (3rd option in image 2). Click on Save button to add this server in "Server Profile" list. 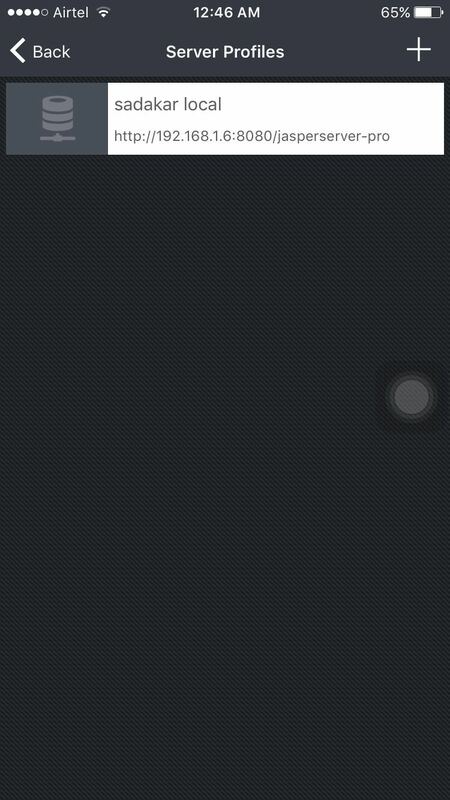 Image-3 : Adding hosted jasperserver in Mobile app "server profile" page. NOTE : If you want to remove this server from list, press on the connection name to get "Edit", "Delete" & "Clone Profile" options. Using these options you can edit the connection, or delete the connection or get a duplicate one. # Give the credentials as shown in below image. # Click on "Login" button to connect to the hosted jasperserver. Image-6 : Jasperserver landing page in App after logging. 3) How to preview a Report ? # By default when you log into the server in app, it will list down all the reports and dashboards available in "Library" in grid view. 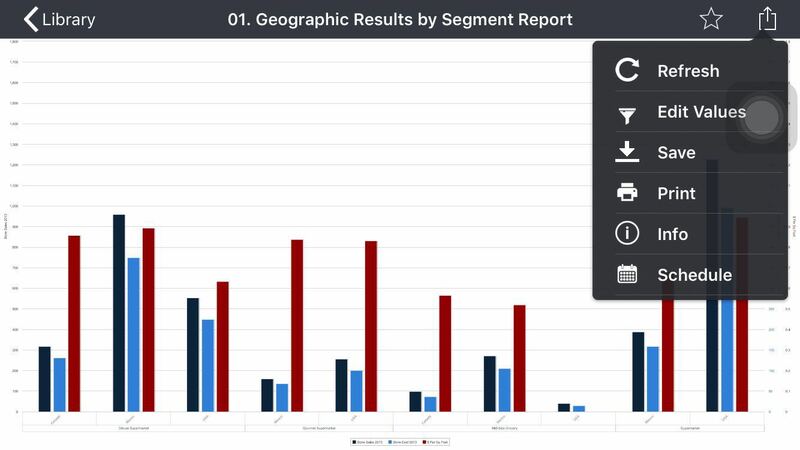 # Click on the first report "01.Geographic Results by Segment Report" & it starts loading the report. Image-6 : 01.Geographic Results by Segment Report mobile horizontal view. 1) Refresh : to refresh the report. 2) Edit Values : Input controls to the report. 4) Print : Print the report as an image if the phone is connected to a printer. 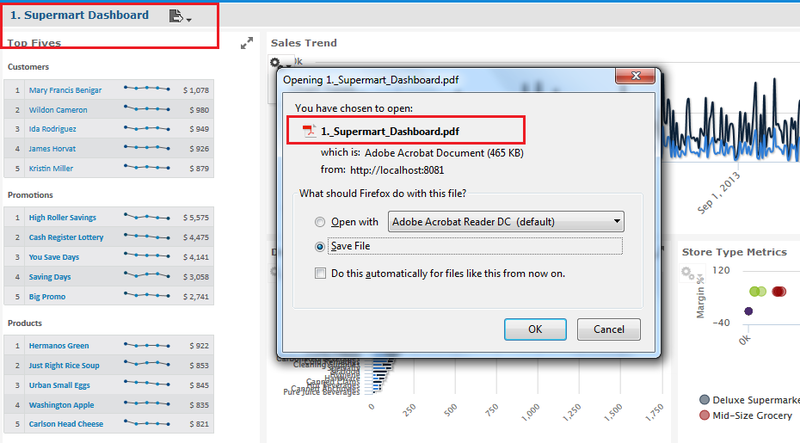 5) Info : Report properties : name, description, path, type , version, creation date & modified date. 6) Schedule : Scheduling options from app. 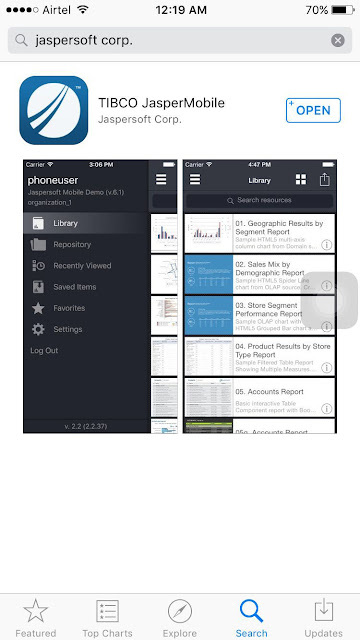 This way you can work with mobile application. Thank you, I hope it helps someone. NOTE : If you are experimenting the same at your home using your own WIFI network and Windows and iPhone devices , you should disable the firewall in your windows. 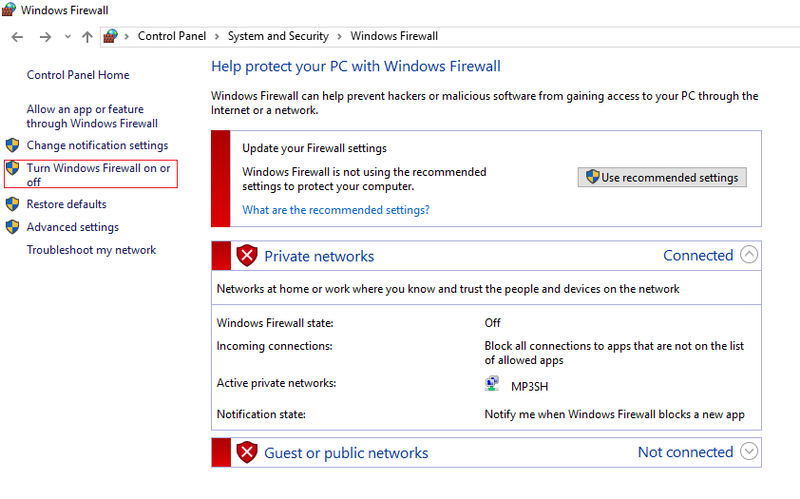 You can not get the IP opened in your phone browser if you wont stop firewall. There are few reports which needs to exported with special characters, for instance bullet pointed sentences or some descriptions about some project or etc. 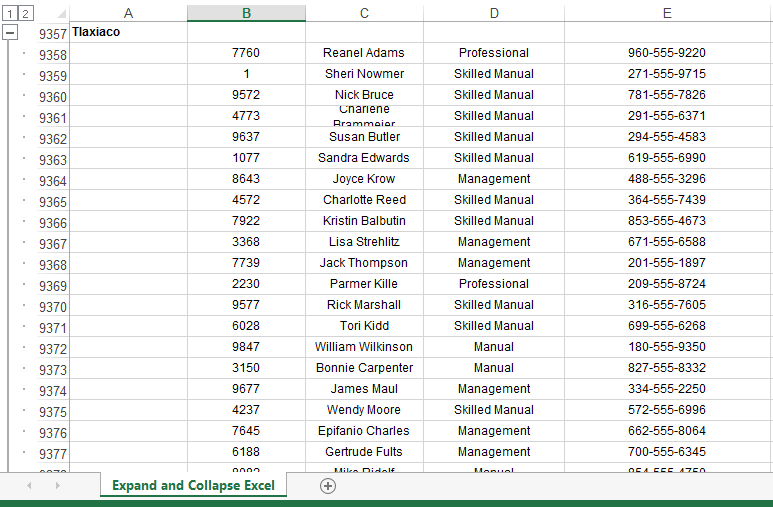 stored in data base field(s) as value(s). 1) Import arial.ttf file into Studio. * If you wont' copy paste you can't find arial.ttf file but you could see other arial font files). 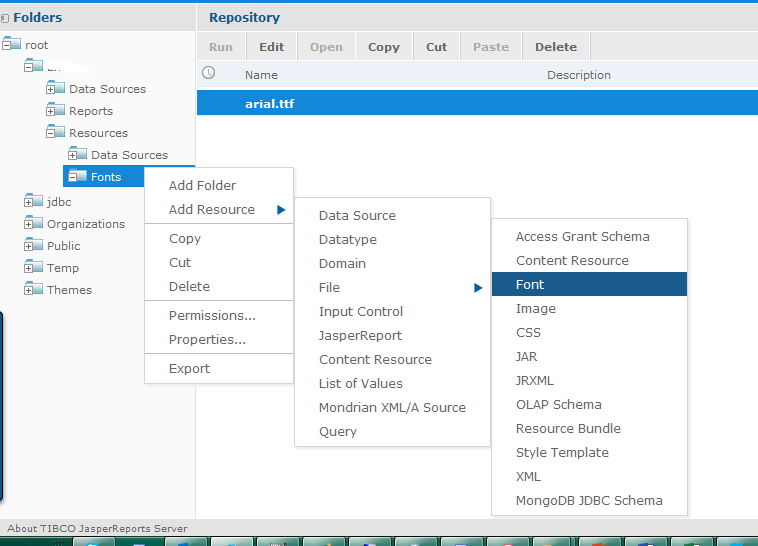 * Navigate to Window -> Preference -> Jasper Studio -> Font from Jasper Studio Menu bar. file from the copied location. 3) As shown in below 2 images select the text field and go to its properties. Check for PDF options and give properties as shown in below text. But when taking the arial.ttf file from jasper server you should change the pdfFontName="repo:/yourfontLocationIntheFolders"
Sample output from Studio when exported to PDF. I hope this helps someone. !